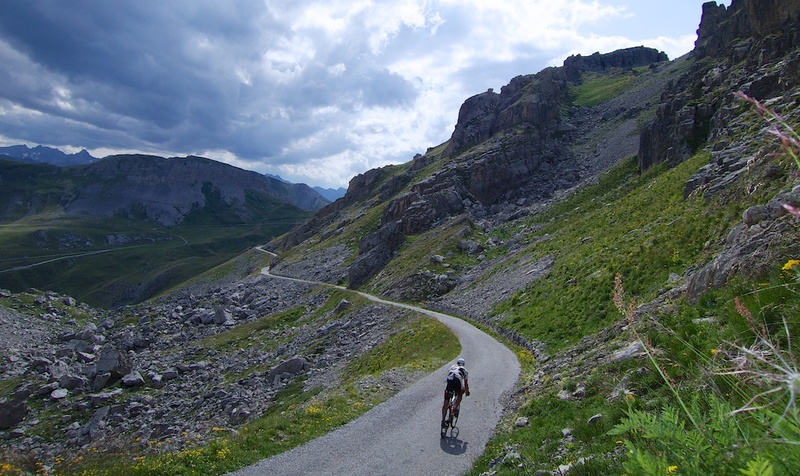 Looking for a tougher 3-side climbing challenge than the Club des Cingles du Ventoux? 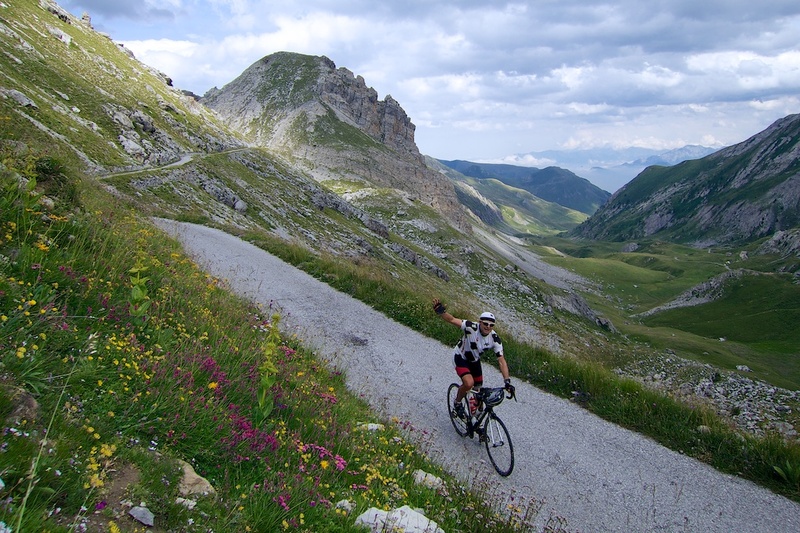 Then try cycling all three sides of Colle Fauniera in a single day. 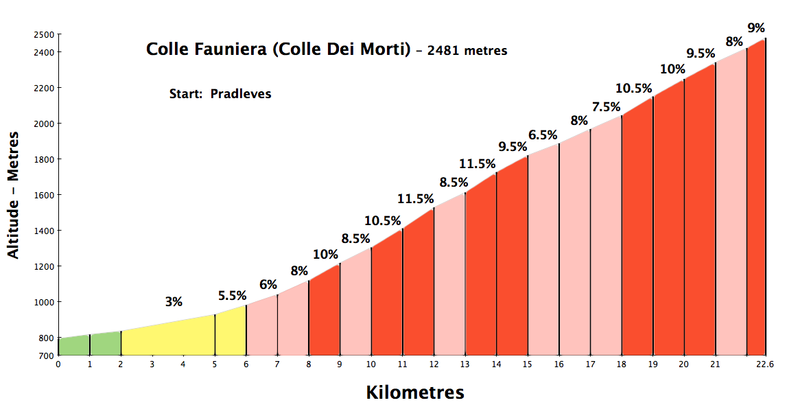 Because unlike Ventoux, Fauniera doesn’t have an “easy” way up. EDIT: I have now done the 3rd side … fantastic. Here are details including going beyond Fauniera on unpaved roads through the Altopiano della Gardetta. Starting in Pradleves, this is one of those magical climbs that is beautiful the entire way up – not just the top stretch. The road is always interesting. The first several kilometres pass up through a tight gorge with a noisy torrent providing a white-noise soundtrack. 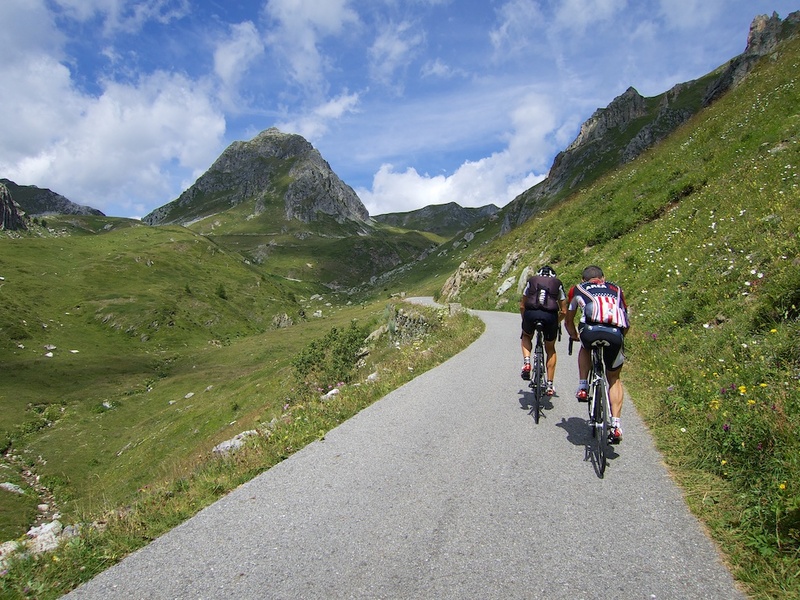 Enjoy these first few easy kilometres because this climb gets tough, with many steep stretches. Take a close look at a few of the signs below. Ouch. 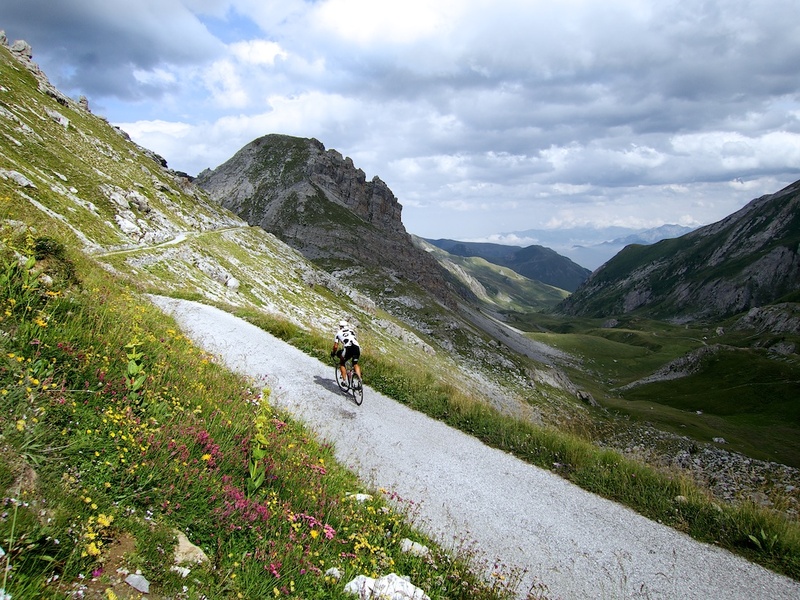 Note, a few of the hairpins are named after famous cyclists (the photo is of the Fausto Coppi hairpin). It is slightly strange that there are hairpins named after famous old cyclists as the Giro d’Italia has only climbed to the summit here once, in 1999, in a famous stage won by Marco Pantani. Fauniera is better known locally as Colle dei Morti – Pass of the Dead. In 1744, French and Spanish soldiers were killed nearby in an ambush by their Savoyard enemies. This is a great climb for “col hunters” as there are two high passes just before Fauniera, and another just after. I’ve labeled them all on the map below. Colle Fauniera (Colle dei Morti) – 2481 metres. Sign is name in local dialect. Colle delle Esischie was a summit finish in the 2003 Giro. But of most interest to me was Colle Valcavera. At the Col I could see very inviting old, unpaved, military roads. A future project would be to climb up this other side with a mountain bike. 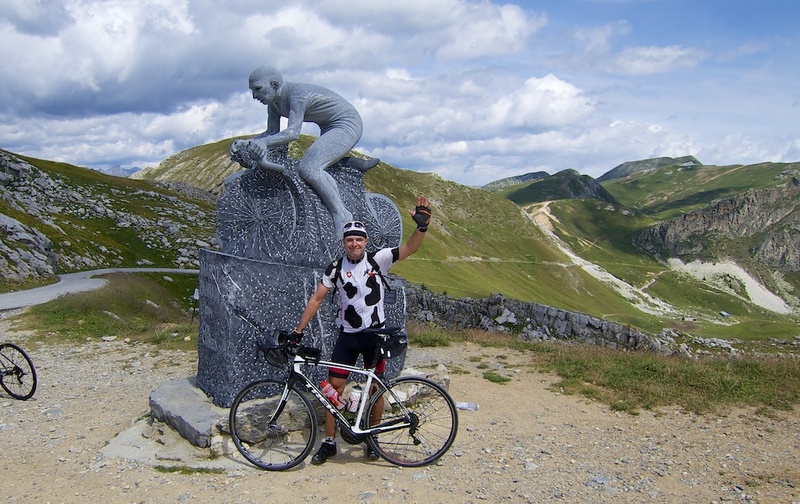 At the summit of Colle Fauniera is a huge statue of the Italian cyclist Marco Pantani. I was so excited by this beautiful climb that – despite my weak legs – I decided to descend all the way to Demonte so that I could see another side. I found the top half of this side – above the tree-line – absolutely beautiful. I know I drool a lot about climbs. But this one really deserves to be near the top of any col hunter’s to-do list. It is fantastic. Hopefully, next year I can visit again, either climbing the third side, or even better, finding a way up by mountain bike. A high, beautiful, difficult, remote climb. I absolutely loved Colle Fauniera. now I was surfing the internet in my boss’ time and came across your nice pages! the hardest stage of that tour: Demonte – Fauniera – Pradleves – Ponte Marmora – Fauniera – Demonte. It’s interesting to read your reports and thrilling to see your beautiful pictures. To be fair, Giro came in 2003 from Pradleves to Colle Esischie in the Chianale stage, thats 95% of the East side. And in 1999, Pantani didn’t win, Savoldelli did, Marco “only” took the pink jersey. Another fantastic climb goes on my to-do-list. For logistic planning which town should I be based in? Other significant climbs in the region? 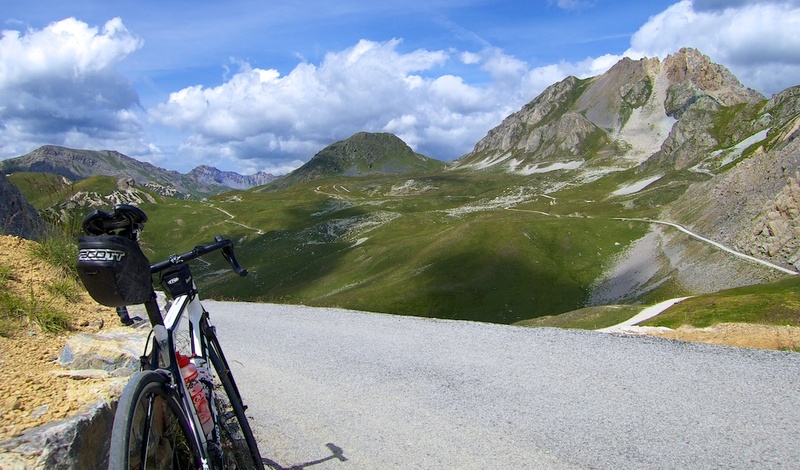 Finestre, Nivolet? Am from Malaysia with very limited knowledge of that area. Thanks. Keep on collecting them cols. Colle dell’Agnello, Colle di Sampeyre, Colle della Lombarda, Colle del Nivolet is a little further north. Note: there are three ways up Fauniera, all very interesting. The two I discuss above and a third starting in Ponte Marmora. When I did this (begin june 2015) the top was covered with snow, and had to get off my bike and walk through the snow to reach the road back down. Was raining from the start of the climb, so got a bit “frozen”. To be honest, I’ve had more pleasant climbs lol. I can definitely say I was happy when I reached civilization again. Didn’t feel really comfortable up above and while descending :p Quite small roads, and some segments are in not all too good conditions back then. On the map above I have labeled the Cols. The Pantani statue is exactly at Colle Fauniera which is a little bit higher than Colle d’Esische. Impressive photos. I like Fauniera. It’s in my top 5. I passed this climb twice. 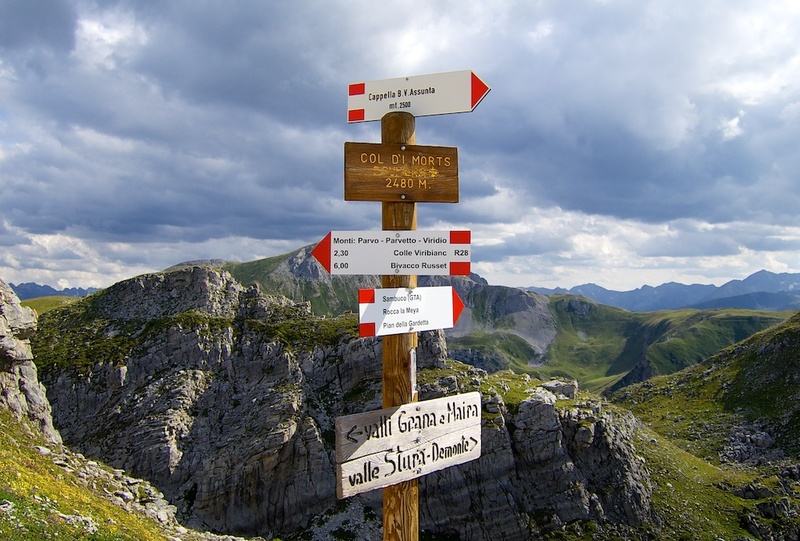 The first from Demonte to Ponte Marmora via Esischie, second loop Demonte – Pradleves – Fauniera – Demonte. Direction to (or from) Ponte Marmora is very nice but bad surfaced. I saw this gravel road from Colle Valcavera. It looks very challenging. 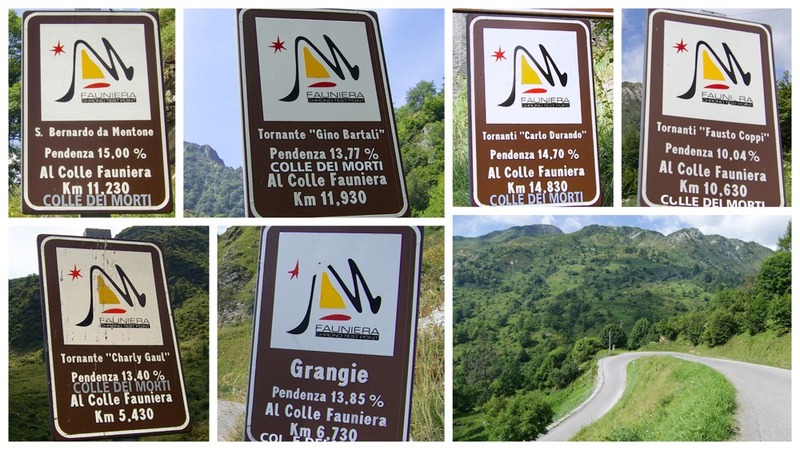 Another great area of old military roads is around Col di Tende but I haven’t visited that’s yet. Recently became aware of your site—tremendous site—so glad you decided to keep it going—a tremendous resource and interesting to always see what is up next. 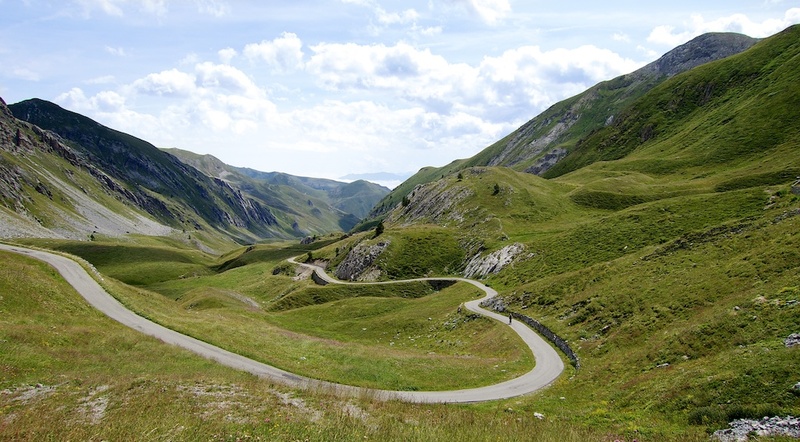 As to the Fauniera—-Of all of the climbs I have done in the States, Italy and France——the Fauniera is the single hardest one I have ever done—unrelenting with little in the help if switchbacks for any relief—and gorgeous the entire way.